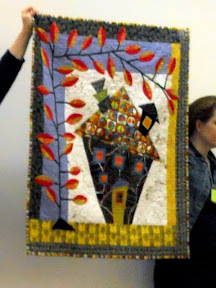 One of the delights of belonging to a quilt guild is the opportunity to meet, learn from, and view the incredible work of some of the best and most well known quilters. 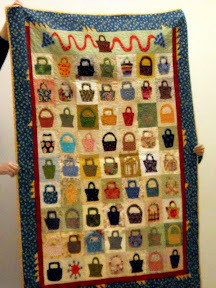 I belong to a rather large group...we have almost 350 members in the Mid-Valley Quilt Guild, here in Salem, Oregon! 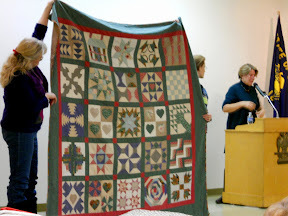 And we have had such a line-up over the years of quilters, quilts, and workshops from some amazing quilters! 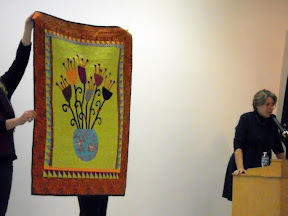 Please note: I apologize for my low jpeg resolution of these photos. 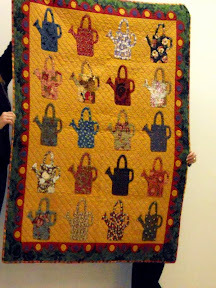 Unfortunately, I grabbed 6 bags as I headed out the door for my Mid-Valley Quilt Guild meeting and all of my day's errands, and none of them was the better camera's bag. 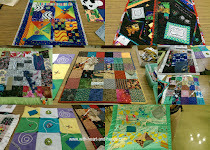 But I still have to thank our lovely MVQG member, Carol, who kept Vanna 1 and Vanna2 holding these quilts in position until my poor little battery depleted, and failing to zoom properly camera could take even these photos! 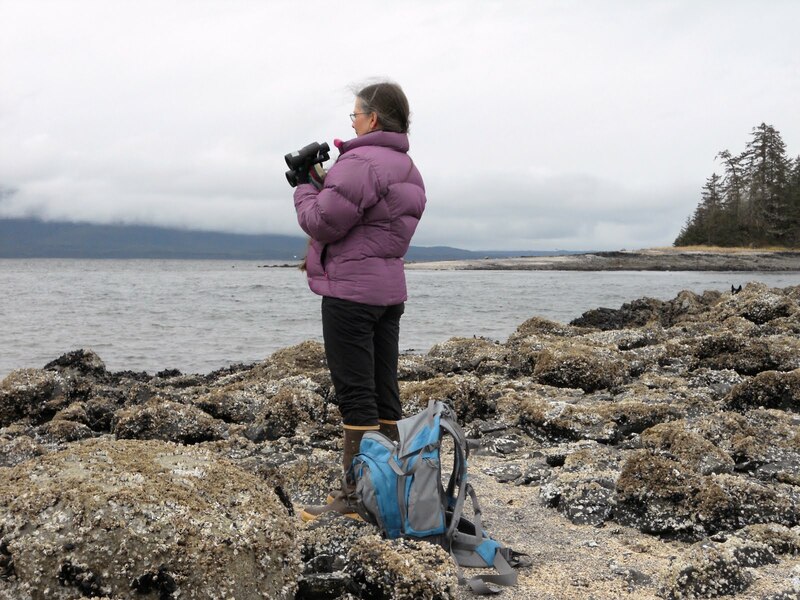 But my little Nikon pocket pal is better than nothing! Be inspired and enjoy. 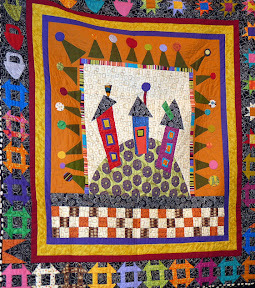 Tonye (pronounced Tony) grew up in Portland and actually went to high school when Jean Wells was still teaching Home Economics classes there. 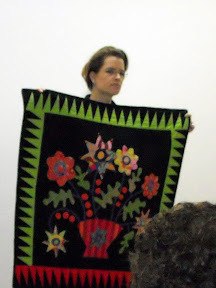 Ironically enough, Tonye wouldn't meet Jean until years later when she took a quilt class from her in Sisters. 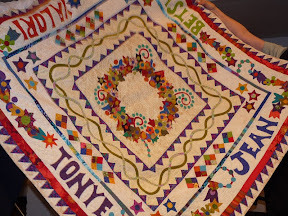 Tonye has a remarkable historic log cabin home in Camp Sherman...near Sisters. 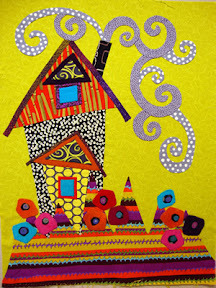 And Tonye's very first quilt...the album quilt above. She claims she didn't know better. Ha! 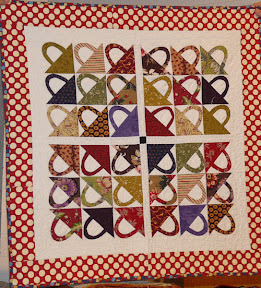 Not what most of us would learn to quilt on ;) I think she just always dreamed big even when she is sewing in the tiny! 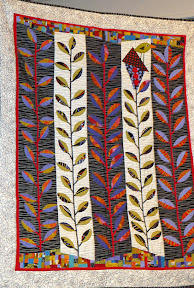 Tonye's work may be quite familiar to you as I'm sure you've seen it before, even if you haven't purchased one of her books or seen her work in person, elsewhere. 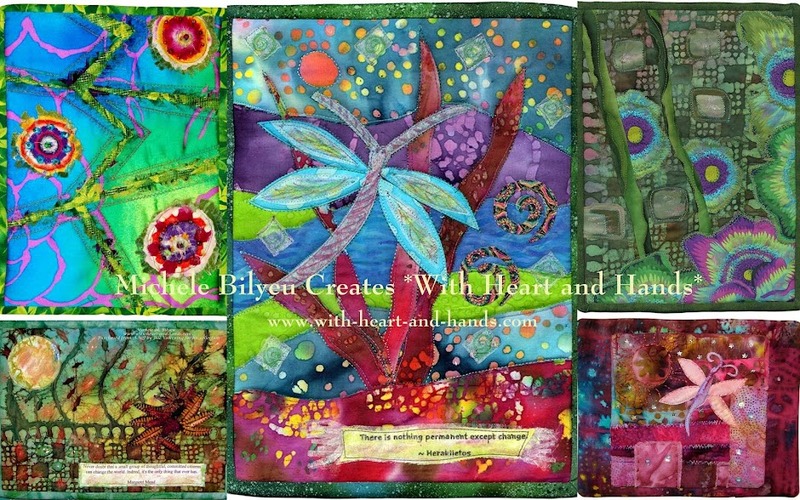 It's bright, colorful, filled with vibrancy, and great charm. 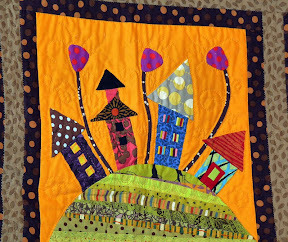 A lot of her more recent work has been done in wool felt and her unique and extremely whimsical applique' style is often incorporate into other's work. 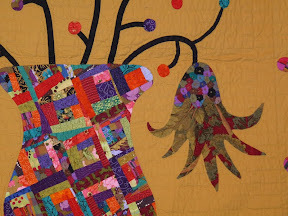 There is so much crossover, as I'm sure you have all noticed in the past decade of quilter's work. How can they help it? 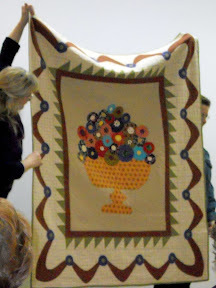 Everyone is inspired by everyone else and they all take one's anothers classed when at quilt shows, together! 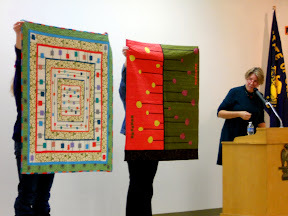 And look at these, above.....these two were Tonye's second and third quilts!! Modern and lovely! 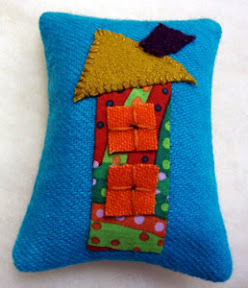 And if you're first thought is I don't do applique or could never make quilts like these...check out the idea of a tiny pillow or even a pincushion like these! See what I mean? Everyone inspires and is inspired by everyone else! Isn't that how it should be? It's all such great fun! 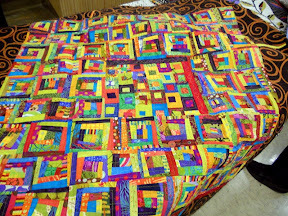 Great quilts, and an amazing funny and creative quilter! 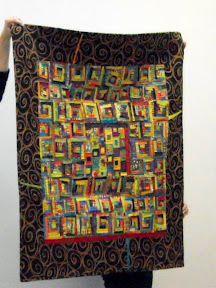 Check out Tonye's work with Kathy Deggendorfer, a wonderful Oregon artist. 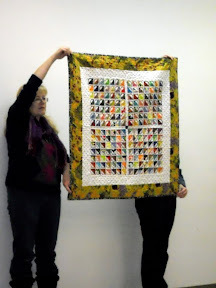 They have done a lot of amazing collaborative work using Tonye's quilts and Kathy's paintings! 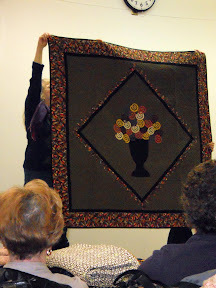 Photo courtesy of google images via Kathy's website. 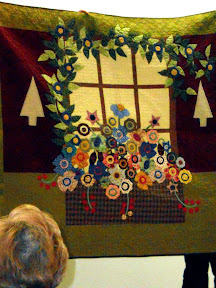 I've also met Kathy at a display at the Oregon State Fair. 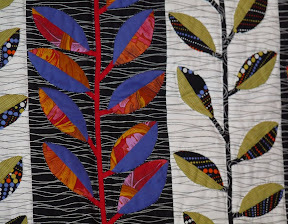 Her work is gorgeous and she is as equally warm, friendly, and inspiration as Tonye is! What a super duo! 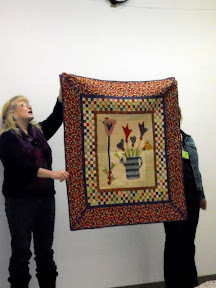 As a lifelong volunteer, I offer links to over 2,500 free patterns for quilts, quilt blocks, crafts, clothing, sewing room accessories, and more. 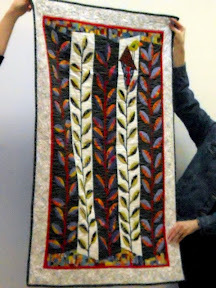 As a committed volunteer for the Alzheimer's Art Quilt Initiative (AAQI) I am always urging others to join in the Liberated Quilting Challenge...and buy or donate a quilt, today!! 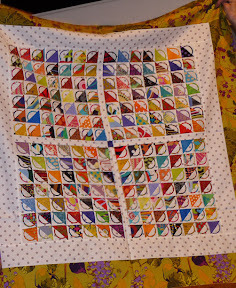 We are all changing the world...one little quilt at a time. 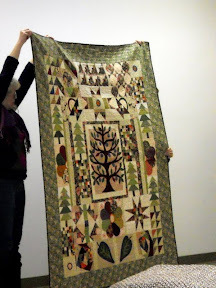 What gorgeous, artful quilts. 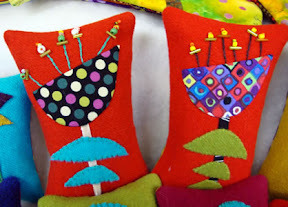 The little projects, pillows, pincushions might work for my own slew of young granddaughters. 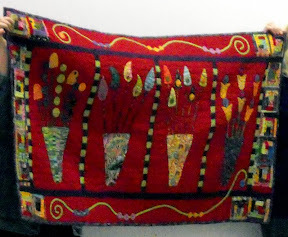 Good work, in many ways. 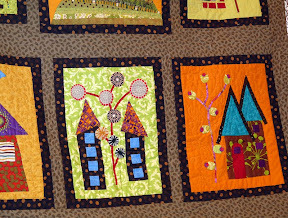 I agree with Celia - gorgeous quilts! What a collection of eye candy! i so agree about inspiration being a good positive cycle of ideas . . . when it's flowing properly it can't fail. 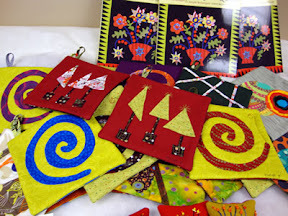 btw: i'm hosting a small giveaway on my blog, if you're interested. Thanks for the comments! I tried going to each of your blogs and leaving you a comment in return on your last post...something I try to do whenever I can. It must be all the google changes from March 1 and all of the new tracking spyware but it will NOT let me leave comments!! I get hung up on 'google analytics'..which I am NOT a member of..and there it stays. Phooie to you Google Spy and Adware!!!!! Too much awesomeness for one page. 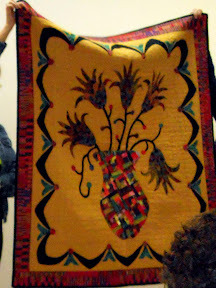 Gorgeous, beautiful, artsy, folksy...I do not have enough words. Love, love, love this display!!! !